On October 28, surrounded by houses topped with solar roofs designed by SolarCity and Tesla, Elon Musk discussed Tesla’s latest products: a Solar Roof, the Powerwall 2, and Powerpack 2. “The goal is to have solar roofs that look better than normal roofs, last longer, provide better insulation, and actually have an installed cost that is less than a normal roof plus electricity. So why would you buy anything else?” he said at a press event. The solar roofs are comprised of glass tiles with photovoltaic cells underneath; the tiles are hydrographic printed to resemble four classic roofing materials: French slate, Tuscan, Smooth, and Textured. Each is printed differently so that each tile is a “special snowflake” Musk quipped. Musk also explained the improvements that the new Powerwall 2 and Powerpack 2 have over their predecessors. The Powerwall 2, meant for single-family homes, has double the energy storage of the first home battery Tesla created, with a usable capacity of 13.5 kWh and 90 percent efficiency. It can also be scaled up to combine nine Powerwalls into one storage unit. 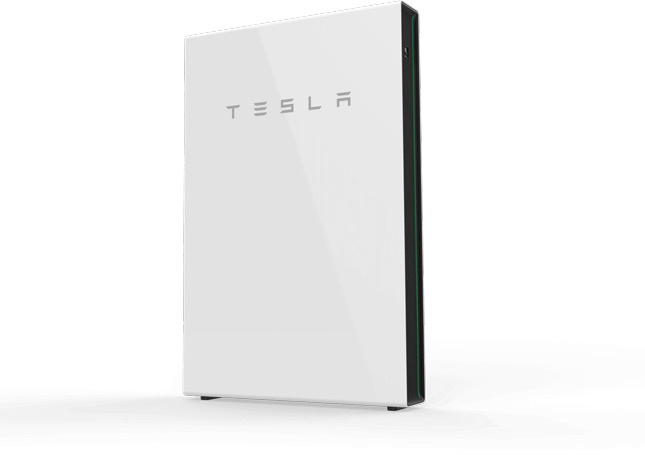 The Powerpack 2, meant for commercial use, is limitlessly scalable, and Tesla is currently working to supply utility company Southern California Edison with 80 MWh of battery storage—the largest lithium-ion battery storage project in the world, according to Tesla. During the day, the photovoltaics charge up the batteries, which then dispense energy throughout the building until the next morning. Each Powerwall 2 can provide a two-bedroom home with one day of power, so service wouldn’t lapse even on a (hypothetically) pitch-black day. Musk discussed the world’s current dire 404 parts-per-million C02 levels in Earth’s atmosphere as vertically climbing since the 1950s. Now that solar roofs are available at a competitive price point (the cost of Tesla’s solar roofs has not yet been disclosed, but Musk said that it would be less than the cost of a standard roof plus the money saved on energy) in a variety of styles, Musk hopes that the four to five million new roofs installed in the U.S. each year can be solar powered, effectively taking millions of people off of the grid. “The whole purpose of Tesla is to bring about sustainable energy,” Musk said. Combining the solar roof with the storage Powerwall or Powerpack and a solar car means a whole household can have an integrated, off-the-grid system.